The biggest city in the Peruvian Amazon, Iquitos was first settled by European-Peruvians in the middle of the 18th century, with its initial purpose being to serve as an important Jesuit mission for the region's natives. It started to expand in a noticeable way roughly a century later, when established settlers defined the region of Loreto and its boundary, making Iquitos the capital in the process. The rubber industry was a key factor in the history of Iquitos, with a major rubber boom taking place here during the early years of the 1900s, drawing huge numbers of immigrants from all across the globe. The majority of those arriving in this remote region of the Amazon were youthful men, all dreaming that rubber would bring them enormous prosperity and a new life. When giant car manufacturers began rolling out their automobiles on production lines in America, this had a knock-on effect for the local rubber industry. Demand grew higher, along with prices, and ambitious locals gained much personal wealth by becoming traders for this commodity. Many of the migrant men began to inter-marry with indigenous Peruvian women, putting down roots with mixed race families. As a result, a truly multi-racial society emerged, although it still clung to traditional European customs and fashions. Sephardic Jews were among the fortune seekers to arrive in Iquitos at this time, coming all the way from Morocco to establish a new community, complete with an ornate synagogue, although the practice of Judaism had largely died out within just a few generations. A concerted effort to revive the faith in this unlikely corner of the world was made in the latter years of the 20th century, with this movement being led by important rabbis from both Lima and New York. Many of the subsequent new converts opted to leave for a new life in Israel. A number of impressive structures remain from the heady early days of the rubber barons, who often financed personal follies. Still standing to this day is the Casa de Fierro, which was designed by famed French architect and civil engineer Alexandre Gustave Eiffel, of Paris Eiffel Tower fame. 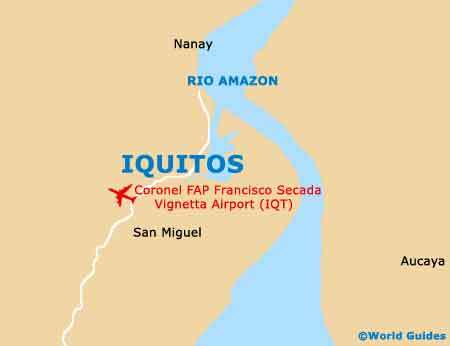 The boom years in the history of Iquitos were brought to an abrupt end, as in much of the Amazon region, after the smuggling out of rubber seeds to other areas of the world led to larger and even more successful plantations elsewhere. The city remains one of the Amazon basin's principal trading ports and now boasts a healthy and gradually increasing population in excess of 400,000. The glory days of Iquitos might be long gone, although today it has some commercial value, generating income from oil and mining of natural resources, with some measure of tourism. A relatively recent key date in the history of Iquitos was in the year of 1963, when a commission to resolve the official founding date of the city settled on the 5th January, 1864, which is now celebrated annually in the city as an official anniversary.